The husband of a special constable, and two other men, have been jailed for life for her murder. But it took some diligent detective work to bring the men to justice. 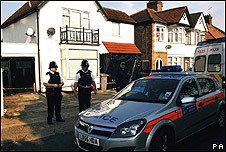 When Nisha Patel-Nasri, an off-duty special constable, was stabbed to death outside her home in May 2006, it was assumed she had been killed after disturbing a burglar or car thief. 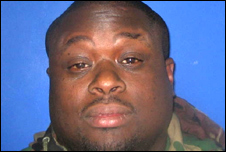 The 29-year-old was known as a feisty character who would not back down from confrontation. One of her fellow special constables, Tony Hayes, described her as "gobby" and said: "She'd be the first out of the carrier if there was a fight." Detective Chief Inspector Nick Scola, who led the inquiry, admits he too assumed she had stumbled across a crime in progress. That theory was given more credence when he learned Nisha had disturbed two men trying to break into her porch a few days before she had died. She had been terrified by the incident and her husband, Fadi Nasri, 34, had ordered a CCTV camera, which had been due to be installed the day after she died. Nasri later made a televised appeal for help in finding her killer and police said he had appeared to be distraught. But six months after Nisha's death, following some diligent detective work, police closed in on the truth. 2355 BST - Mr Emmanuel's phone is used to call Leslie and 15 seconds later Leslie calls Nasri. Officers had discovered the murder weapon - a knife from John Lewis which had been taken from Nisha's home - in a drain a couple of streets away from where she was attacked in Wembley, north-west London. 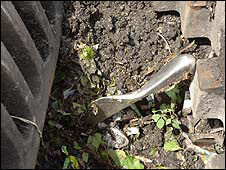 Detectives later realised a CCTV camera had been focused on the street only yards from the drain. Analysing the footage provided a vital clue. At about midnight on the night of the murder, a silver Audi A4 had stopped for eight seconds next to the drain. Police trawled the records of thousands of Audis before they finally traced the car, which had a unique radio aerial and a distinctive missing number-plate light, to nightclub bouncer Tony Emmanuel. Mr Emmanuel, 42, was interviewed and eventually made a prepared statement in which he admitted driving "a friend" to the Wembley area but said he was too scared to name the man, who he believed had killed Nisha. But in a later interview Mr Emmanuel named Jason Jones, 36, and said his passenger had dropped a knife in the drain on the night of the murder after saying "it had all gone wrong". Mr Emmanuel, who has been acquitted of murder, said he had no idea Jones planned to attack Nisha. He told police Jones had mentioned afterwards that the woman's husband had organised it. Mr Emmanuel said he had given Jones a lift to Wembley, believing he was conducting a drug deal. DCI Scola said even at this point he had not suspected Nasri and thought for a time Nisha's husband might have been the intended target of the attack. But when police looked at Nasri's mobile phone records - after he mentioned receiving threatening calls from Scotland - they noticed he had called a man called Roger Leslie, 38, on the night of the murder. Leslie's phone had also been in frequent contact with a mobile belonging to Mr Emmanuel that night. Closer inspection of Nasri's three-year-old marriage revealed that he had been having an affair and stood to gain considerably financially in the event of his wife's death. Much of what happened that night remains speculation. But what was clear was that Nasri had used Leslie to set up the killing. At the trial, Leslie denied a rumour that each of the studs in his face - he has a dozen - represented someone he had killed. He said they represented people he knew who had died. Nasri had already organised a solid alibi by arranging to play snooker with a friend, Mahul Desai, who was unaware of the role he was playing. DCI Scola said it was significant that a set of keys was missing. He believes Jones, furnished with the keys and the knife, entered the house and confronted Nisha, who came down the stairs armed with a torch, which she was later found clutching. She ran outside and was stabbed to death after ringing 999 and shouting: "He's coming after me." In court Mr Emmanuel said he had been hoodwinked and had driven Jones there only as part of a drug deal. Leslie said 1.5kg of cocaine was due to be picked up from the boot of a Hummer limousine outside Nasri's house. Nasri denied having anything to do with drugs or murder and said he had been on the phone to Leslie discussing a limousine booking. Mr Emmanuel said Jones had been using his phone and it must have been him talking to Leslie but Jones said he had been nowhere near Wembley that night. On Wednesday Nasri was ordered to serve a minimum of 20 years and Leslie and Jones were locked up for at least 18 years. Judge Peter Beaumont, the Recorder of London, said of Nisha: "She was a loyal, loving and supportive wife." Nasri's betrayal had amounted to a "gross abuse of the trust he owed her as her husband", the judge added.